French customs officials unions have disrupted Eurostar train traffic in recent weeks, and in the UK, recent acts of protest and sabotage have raised concern that the rail link represents a target for pro-Brexit protesters. 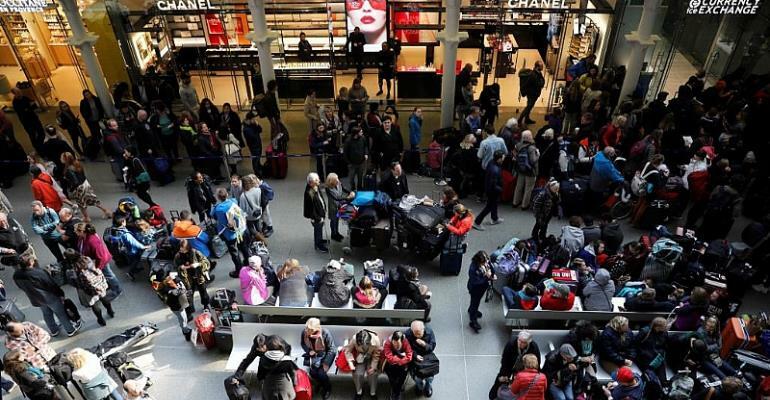 A work-to-rule action called by unions representing customs officials has been slowing down boarding and departure times at the Gare du Nord train station in Paris since early March, causing cancellations and delays that have left some passengers complaining of waits of several hours. Unions say they are seeking better salaries, but also say they are showing the need to boost staff resources to cope with Brexit. “There are three issues on the table: staffing, working conditions and improved purchasing power,” said Vincent Thomazo, secretary general of Unsa Douanes, the union of French customs officials. Service was mostly normal after two early morning cancellations on Wednesday, but with unions and the government not having resolved the standoff, the railway warned future disruptions could not be ruled out. “We advise passengers to keep an eye on our website and social media for live updates on the situation at Gare du Nord,” said Eurostar. Across the Channel, recent incidents of protest and attempted sabotage have raised a concern that Eurostar represents a target of increasingly virulent pro-Brexit protesters. A man standing on the roof of a tunnel leading away from London's St Pancras international rail station with a St George's flag disrupted traffic between Friday evening and Saturday morning, forcing the cancellation of eight Eurostar trains. The man appeared on the roof in the hours after thousands of pro-Brexit protesters demonstrated outside Britain's parliament, angry about the country's delayed departure from the European Union. The British Transport Police (BTP) said the “incident was extremely challenging” and that the man would face charges of obstructing the railway and causing a public nuisance. Following the incident, the BTP reported on Tuesday it was probing two recent acts of attempted sabotage on rail lines elsewhere in the country in late March that appeared to be related to pro-Brexit sentiment. “We're are currently keeping an open mind on why someone would put their life at risk to place these items on a live railway, however our early assessment has led us to believe it relates to Britain's exit from the European Union,” said BTP spokesperson Sean O'Callaghan in a statement. The combined incidents along with tensions around Britain's difficult departure from the EU have led a British union to say on Wednesday that the cross-Channel rail link represents a target of pro-Brexit protest. Transport Salaries Staffs' Association (TSSA), which represents rail workers in the UK and Ireland, has called a meeting with the Eurostar officials to discuss safety measures. “We are very concerned at reports pro-Brexit supporters have accessed our rail infrastructure with the aim of causing delays and chaos,” said union secretary general Manuel Cortes in a statement.